We have spent much time and labor in creating a wildlife sanctuary in our backyard on Old Ivy Road. The overgrown mess of ivy and sapling trees has been replaced with brick walkways, ponds, bridges, waterfalls, plantings and seating areas to relax at and take in nature. Since our project began about 10 years ago, our landscape has matured nicely and has served as a refuge for hours of enjoyment. During the past years we have observed the wildlife of Georgia and it’s apparent appreciation of our green space. The most memorable visitor was the two foot diameter snapping turtle that took up temporary residence in one of our ponds. We drained the pond, captured the unwanted creature and relocated it to a nearby Atlanta Buckhead stream. Frogs have been permanent dwellers since the ponds were built. Their “screams” alert other amphibians of our approach and startle us as we walk down the pathways. Their nighttime serenades keep our backyard alive during the darkest of warm summer nights. Snakes help keep nature in check and keep the frog population under control. We have observed King Snakes eating worms on the pathways after a summer rain, and our experience with a mature copperhead snake reminds us that there must be many unseen hungry offspring slithering around. Feathered friends are abundant as well. My favorite is the Pileated Woodpecker. This large colorful woodpecker was an inspiration to create my first prototype website after hurricane Opal blew down one of our hickory trees in 1995. We have fish too. We introduced Koi to the ponds when they were built. The fish matured, produced offspring and replaced the older fish that disappeared over the years. The fish, frogs, snakes, turtles and woodpeckers all seem to coexist together in a tranquil backyard harmony until this past week. 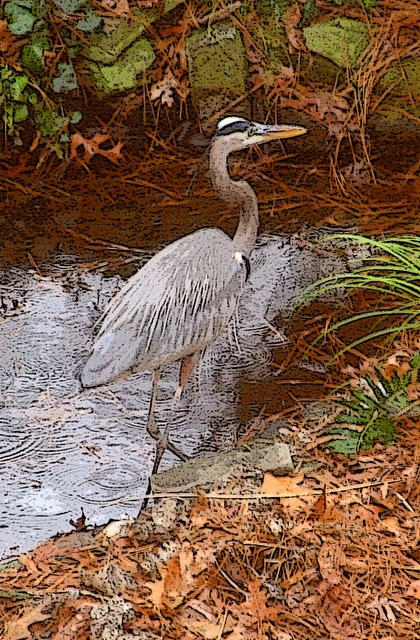 We observed a four foot tall Blue Heron, knee deep in the pond making a buffet of our prized Koi. Being startled to see such a large intruder I took a couple of shots at it (with my Canon camera) and chased it off. Later I saw that it was back for a second course and shooed it away again. This bird has to go! I realize that it will not be as easy as removing the snapping turtle though. I went to the web looking for some direction. I Googled Blue Herons and found an article describing how to construct a chicken wire tent / fence over the pond to protect the Koi from fish eating birds. I did not find this solution appealing since chicken wire does not occur naturally in the wild. Another article I found about Blue Herons and Georgia explained their habitats, breeding, feeding and that they are NOT considered an “endangered” or a “protected” species. Well, I think this particular bird could be “in danger”! 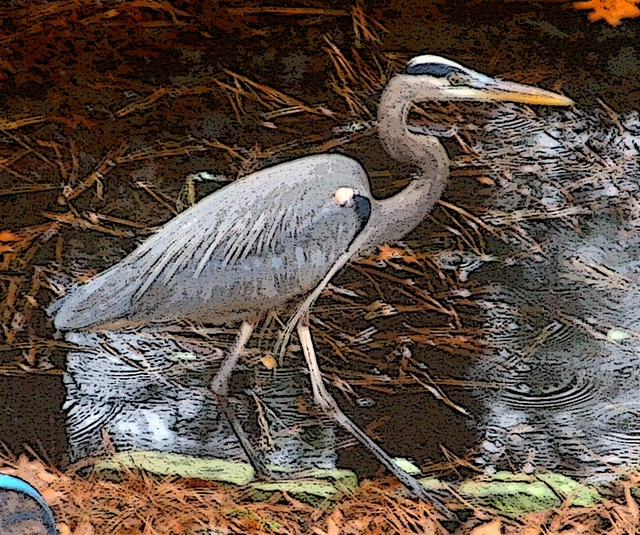 I narrowed my search to Blue Herons and Atlanta only to find that within my neighborhood there is a non-profit organization named “Blue Heron Preserve” that is located on the Lake Emma Wetlands, a few blocks away from my home, as explained on the North Buckhead website. The website stated the Lake Emma Wetlands would preserve wildlife in its natural environment. Wildlife observed include two deer, a beaver, an otter family, mink, Canada geese, mallards, wood ducks, fox, turtles, raccoons, opossums, and of course, the blue heron. Well, why can’t this non-profit organization keep “their” bird in “their” preserve? If this keeps up I will make my own preserves. Twelve Ounce bottles of Old Ivy Blue Heron Preserves! 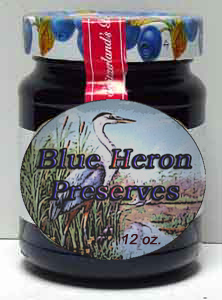 Old Ivy - Blue Heron Preserves - 12 oz.